I found a handful of loose slides and today I'm scanning them. This batch needs a lot of hand-restoration with Photoshop; I'll leave the touchup of dirt and scratches to later, but just getting the colors even remotely correct has been a challenge, since these are old and have not been properly stored. This one seems to be me, on the right, maybe circa 1969, in Seattle, but I'm not certain where. Is this in my yard at the time? I don't know. 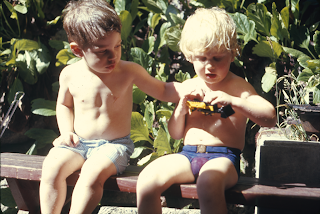 I think the boy on the left is Michael, the son of my mom's friend whose name escapes me at the moment. I look to be about two. I've never seen this picture before. There's probably a story behind it. The slide is marked July 1970, and I think my parents' relationship was either hopelessly broken or badly damaged at this point. I don't look happy. But maybe I'm reading too much into it. When I look at it I feel as if I'm on the verge of remembering what it was like to be that two-year-old boy (I had not yet turned three), as if those memories are still in there somewhere! This next one was over-exposed to begin with and the dyes are very faded, meaning that it lets most light of the light from the scanner through, and comes out almost white. This means it requires a lot of darkening and contrast-enhancement to see much of anything, and there is hardly any color left to correct. 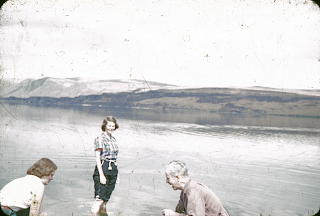 I'm sure a pro could get this looking better, but here it is: Richard, Joan, and Susan Armstrong perhaps around 1955. Are they all in the water? The way the shot is framed, it is hard to tell. 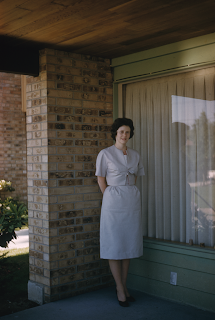 Hand-written on the slide is "at Sun Lake, Washington." Next, a fantastic photo of my mom. This one was remarkably well-preserved. The slide is stamped "61R" which I'm thinking might indicate 1961 -- was this taken at Fircrest School? 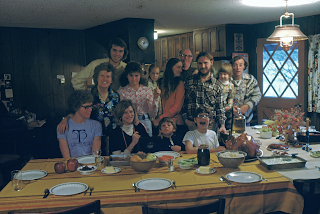 This next one is my father's family in Eatonville, Washington: Thanksgiving, 1975. I'm not certain who everyone is, but Amby, Mary, Elmer, Sally, Aaron, and Ted I recognize. 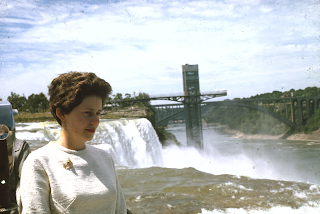 And finally, my mother at Niagara Falls. My father wrote "Fascination" on a label on the slide's cardboard holder! The colors have held up reasonably well but this slide is badly stained and very dirty. I was able to clean some of the gunk off with emulsion cleaning fluid but it will still need a lot of touch-up in Photoshop if I'm ever going to use this one for high-resolution printing.